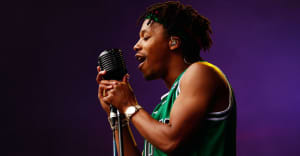 Lupe Fiasco might be the first contender. Calling upon the rap days of old, when dueling MCs would battle rap in real time instead of in back to back singles, Yasiin Bey has challenged the entire hip-hop world to a rap battle. The Brooklyn icon, who most know as Mos Def, posted a video today in which he declared, "[I'm] tired of these dudes pretending that they dope...you aight but you not that dope." Bey went on to challenge anybody (literally, anybody) to a battle. Lupe Fiasco, who offered up some valuable perspective on the Drake and Meek Mill squabble, was the first to accept the challenge, taking to Instagram to officially enter the ring. Lupe posted a series of images that, albeit respectfully, took Yasiin up on his offer. No word on how this all will actually go down but in the video Bey calls for Red Bull Music Academy to "put a million on it." Watch Yasiin's video above and check out Lupe's response below.